DWF - The Digital Watch Forum • View topic - Bulova Spaceview "Cushion Case"
Still pretty new to the site, first time on this forum. I'm very happy I found it, as part of my collection is a great fit for it. 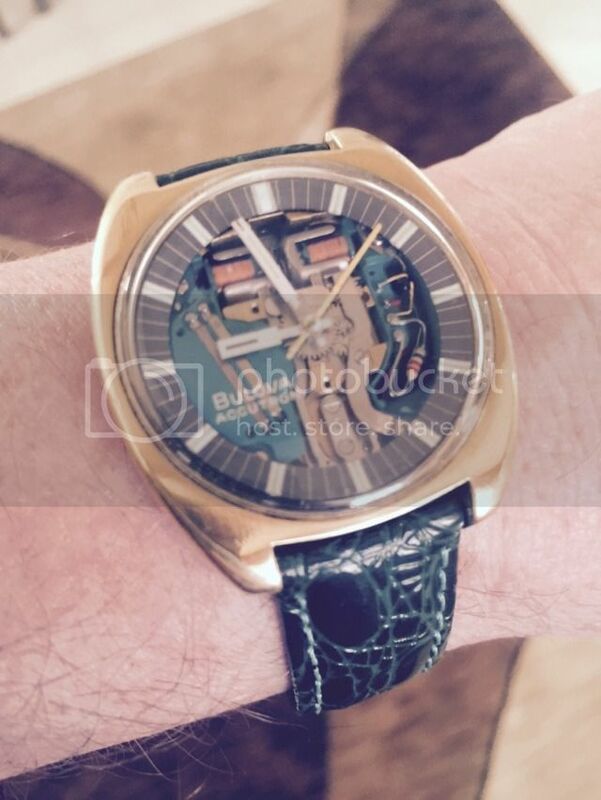 Here's one of my favorites - a 1970 Bulova Spaceview Cushion Case. I found this beauty at a Flea Market a few years ago. Re: Bulova Spaceview "Cushion Case"
The marketing group at Bulova correctly decided that top-of-the-line solid gold cases would convey a sense of enduring quality to the upstart Accutron technology. Bulova used two 14 kt. gold "Spaceviewed" models in an advertising campaign which was intended to accomplish two things. The idea was to differentiate and create excitement around Accutron's ordinary looking dial models by giving the public a glimpse at the technology inside, and to link the development program which created Accutron to the US space program. The advertising worked brilliantly. Know the watch, know his histoy superb piece..keep posting these. Very nice Time Piece. I own a few accutrons myself. Very unique watches!!! Also what a collection of astronauts. As I mainly collect digitals I only have one 214 and here it is. Comments welcome as I know very little about these. Here's my only other accutron..
Nice watches folks!!! Those Astronauts are scoop nice. I'm looking for one myself. jagmad wrote: Thanks for the info. I am not an expert but what little info I have I will share. Your first pic the Chapter ring spaceview has the gold tone movement which came out around 1968 so your date code should be M8 or higher for that Gold Toned movement to be correct. The early M0-M7 would be Zinc colored. The bottom pic is a nice accutron movement 2181. (2181) would be a 218 with a date window, a 2182 would be a date/day window. Both very nice accutrons either way. Many times its hard to pic out an accutron that is near correct as they have been messed with over the many years they have existed. Chapter Ring Spaceviews near abit harder to 'fake' and thus somewhat more collectible. The gold movement in an earlier case. I also didn't pay an arm and a leg for it. the spaceview, if not manufactured/raped, because of their higher price. and two sapphires with what looks like a duck flying with something on it's back. Still haven't found out what it's about but the words, SILVER LINK CLUB are engraved on the case back. Looks really nice on and I love the way they hum. make them has all been scraped/lost. Not sure if it's true though. Very nice pics. Your second watch considering the date N6(1976) (second to the last year of the tuning fork watches could actually be a 219 movement). Only way to find out would be to take the back off. Both a nice part of a vintage collection. Timecollector wrote: Very nice pics. Your second watch considering the date N6(1976) (second to the last year of the tuning fork watches could actually be a 219 movement). Only way to find out would be to take the back off. Both a nice part of a vintage collection. Yep your correct again it is the less interesting but more accurate hummer the 912. I'm still looking for an out of the ordinary 218 either 1 or 2 I'm in no rush. So many watches, not enough Wrist's or Day's I'm afraid. Sigh. Thanks for the info again.